Did you know that stroke is the No. 1 cause of adult disability in the United States, and the fifth leading cause of death? Though significant advancements in preventing and treating stroke are saving more lives, important research is ongoing. To help us better understand stroke and some of the latest treatments, we spoke with Ted J. Lowenkopf, M.D., a neurologist, researcher and teacher specializing in stroke. Dr. Lowenkopf is also medical director at Providence Stroke Center in Portland. Question: How did you become interested in stroke? While in medical school, I recognized that what defines each of us, all our sensation and movement, our thoughts and speech, memory, personality and moods could be explained by understanding the human brain: a 3-pound structure with the consistency of cold oatmeal. In an often tragic way, stroke reveals brain function. Injury to a specific part of the brain shows what that area controls. A person can lose specific abilities, such as speech, movement or vision. In choosing stroke as a profession, I wanted to better understand the brain but, more importantly, be involved in treating and preventing stroke. Q: What are some of the recent advances in treating stroke? Twenty years ago stroke patients went to nursing homes for short- or long-term care. Rehabilitation was the only therapy for stroke recovery. In 1996, the first therapy for acute stroke treatment was approved. Tissue plasminogen activator or tPA, a clot-busting drug, was introduced. The drug could be used in the first three hours after stroke to open up blocked blood vessels to the brain and reduce the chance for disability from stroke. Since then, it has been used in some patients up to 4.5 hours after stroke. In 2014, we saw for the first time that clot retrieval devices could be used in the first six hours of stroke to remove blood clots from blood vessels in the brain and improve a person’s chance of recovery. In the past few years, we’ve recognized that most strokes can be prevented through aggressive management of stroke risk factors, such as high blood pressure, high cholesterol and smoking. Q: Can you explain why people need to get to the hospital right away when they are having a stroke? The brain is the most sensitive part of the body and the most susceptible to injury when blood supply is cut off. The brain is critically dependent on blood flow for the oxygen and glucose (sugar) that it needs. When blood flow stops, 2 million brain cells die per minute. The risk of permanent brain injury and disability decreases if a stroke patient can quickly get to a hospital that can perform the clot-dissolving and clot-removing therapies that can minimize injury and disability. After the first few hours, the brain injury is irreversible. Time is brain. Q: What is a thrombectomy? A thrombectomy is the process by which a specialized wire is inserted into a blood vessel at the top inside part of the leg and threaded through the vessel to the place where a clot is blocking blood flow in the brain and causing the stroke. This tiny wire grabs the clot and pulls it out of the body. As in any acute stroke treatment, time is of the essence when performing a thrombectomy. Q: Can you explain the different types of strokes—hemorrhagic stroke and ischemic stroke – and whether you treat them the same? A brain hemorrhage or hemorrhagic stroke takes place when a blood vessel in or around the brain ruptures and blood goes into and around the brain, creating swelling and pressure. The blood vessel is compressed by a blood clot that forms when there is bleeding. This type of stroke accounts for approximately 20 percent of all strokes. Hemorrhages in the brain cannot be treated with a clot-dissolving drug because it increases the risk of further bleeding. Typically, hemorrhages are surgically removed if they are large or to stop a ruptured blood vessel from further bleeding. An ischemic stroke accounts for approximately 80 percent of all strokes. It occurs when a blood vessel is blocked by a clot that has formed in the heart or in a blood vessel, travels to the brain, and blocks a blood vessel there. A simple CAT scan can immediately distinguish these two types of strokes. Q: How is telestroke used on patients outside of the Portland area? 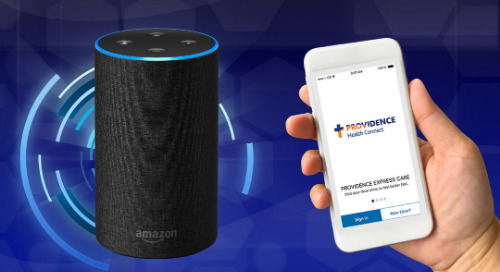 The Providence Telestroke Network – the largest in the Northwest – uses sophisticated mobile computers to evaluate a patient who may be having an acute stroke if no stroke expert is available at the hospital where the patient is. Most hospitals do not have stroke experts on-site, and this technology enables us to examine and speak to patients and their families to determine whether they are candidates for the acute stroke treatments described above. Q: When patients have damage after a stroke, can they still get better and regain function? Most stroke survivors make some improvement spontaneously and with rehabilitation therapies. This recovery typically takes place for up to a year after the stroke. Unfortunately most stroke survivors have some degree of long-term disability. Improving stroke recovery, outside of the acute treatments, is an area of active research. Did you know strokes are on the rise in people under 40 years? You can take a number of preventive measures to reduce your risk of stroke. Get more tips from Dr. Lowenkopf here. You might also visit the Providence Stroke Center website to learn more. The Centers for Disease Control and Prevention also offers a wealth of information about stroke, treatment and prevention. If you’re concerned about stroke or have questions, talk to your health care provider. You can find a Providence provider throughout the West. Visit our multistate directory to find a provider in your area.